Penny Churchill looks at two properties that may be linked by a scandalous liaison. The four buildings mentioned— Gawsworth Old Hall, Gawsworth New Hall, the village church of St James and The Old Rectory—were once the heart of a great east Cheshire estate that had its heyday in Tudor times. Their 500 years of shared history— a delicious mix of scandal, intrigue, violence and eccentricity—are highlighted by the launch onto the open market of exquisite, Grade I-listed The Old Rectory, Gawsworth, through the Wilmslow office of Savills (01625 417450) at a guide price of £3.95 million. Only five families have owned the Gawsworth estate since Norman times. For several hundred years from the late 1300s, the manor was the seat of the Fittons, Earls of Macclesfield, three of whom were High Sheriffs of Cheshire between 1531 and 1632. They built the present, black-and-white, half-timbered Gawsworth Old Hall to replace an earlier medieval house in about 1480. Both The Old Rectory and the church of St James pre-date the hall, the rectory dating from about 1470, and the oldest part of the church (described by Pevsner as ‘pretty, but odd’) from 1430. In the late 1500s, the well-connected Sir Edward Fitton spent a fortune creating a spectacular Elizabethan garden at the Old Hall, complete with a mile-long Tudor walk, a series of five lakes and wonderful avenues of lime trees, in the hope of securing a royal visit that never happened. Instead, the family’s honour was sullied when, in 1600, Sir Edward’s wilful younger daughter, Mary, a maid of honour to Elizabeth I, had an affair with William Herbert, heir to the Earl of Pembroke, and, by January 1601, was pregnant by him. By then, Herbert had inherited the earldom and, although he acknowledged paternity of his son, who died shortly after birth, he refused to marry Mary and she was packed off back to the country in disgrace. Banished from the family home, she went to live at The Old Rectory, from where she embarked on a series of affairs that scandalised Cheshire Society, eventually marrying twice and producing a number of children by her various amours. Rightly or wrongly, Mary’s colourful reputation identified her as the ‘dark lady’ of Shakespeare’s sonnets in the eyes of many scholars, although, centuries later, the debate is still ongoing. The Fitton family fortunes never quite recovered after that and, event- ually, the family also ran out of heirs. By the late 1800s, Gawsworth was owned by the Stanhopes, Earls of Harrington, whose name is immortalised in the quaint Harrington Arms village pub, a short walk from The Old Rectory, which was sold away in recent years by the present owners of Gawsworth Old Hall. Cited in its English Heritage listing as ‘one of the best preserved medium-sized houses of the period in Cheshire, particularly valuable for the survival of the open hall’, the inch-by-inch renovation of The Old Rectory represents a real tour de force on the part of its current owners. Not only have they executed a daunting three-year restoration programme that complements major conservation work done in 1724 by the then rector William Hall, as well as that of Norman Shaw in 1873, but they have seamlessly integrated such modern essentials as a light-filled farmhouse kitchen and luxurious, stylish bathrooms. All within the restrictions imposed by the former rectory’s Grade I listing. The showstopper is the spectacular, double-height Great Hall, a glorious room with magnificent timbers and a grand fireplace. 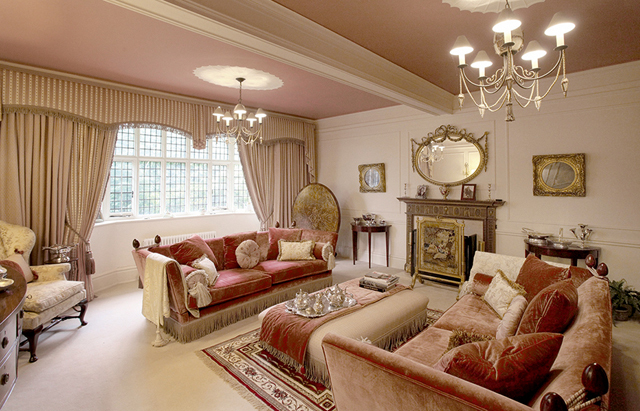 To the left of the hall is a beautifully panelled library with carved ceiling timbers; to the right, Norman Shaw’s elegant drawing room, with its Adam-style fireplace and wide leaded window. It took two years to strip every beam in the house of its black Victorian coating to reveal the magnificent original timbers beneath. 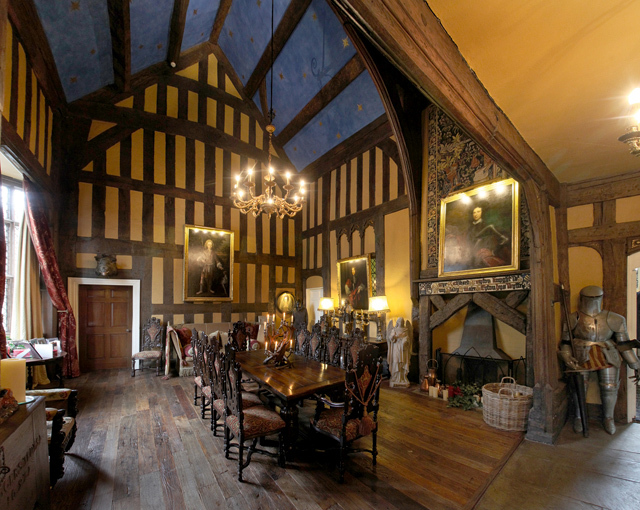 The Old Rectory’s spectacular double-height Great Hall. Most of the house’s period furniture is available by separate negotiation. 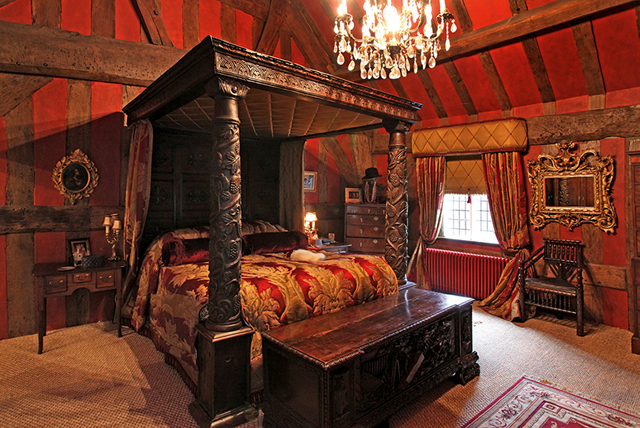 Not surprisingly, the most captivating rooms are those to be found in the oldest part of the house, such as Mary Fitton’s bedroom and the original 1470 red bedroom, all of which have been decked out in carefully sourced period furniture—most is available for purchase by separate negotiation. But for all its architectural importance, The Old Rectory is no living museum, but a delightfully quirky family house in an idyllic private setting, with a manageable 6,845sq ft of living space, including six reception rooms, seven bedrooms, four bathrooms and a guest wing. Escape to the country is also an option, in the shape of the converted former cricket pavilion, now a two- bedroom, African-style lodge with a vast open-plan reception room overlooking a rural landscape that probably hasn’t changed since the former rectory was first built. Another long-running family saga nears its conclusion with the launch onto the market of Grade II*-listed Cefntilla, near Usk, Monmouthshire, through the Hereford office of Knight Frank (01432 273087) at a guide price of £1.65m. By coincidence, the original Jacobean house can be dated by the fireplace in the Great Hall, inscribed ‘1616’ and showing the Herbert arms, perhaps indicating some connection with the author of Mary Fitton’s downfall. After years of ownership by various members of the Oates family, Cefntilla fell into disrepair before being rescued in 1856 by the Raglan Memorial Committee, which purchased the house and its then 300-acre estate for the widow and descendants of FitzRoy Somerset, 1st Lord Raglan, who died in the Crimea in 1855 while leading the British expeditionary force and will be forever associated with the disastrous Charge of the Light Brigade. 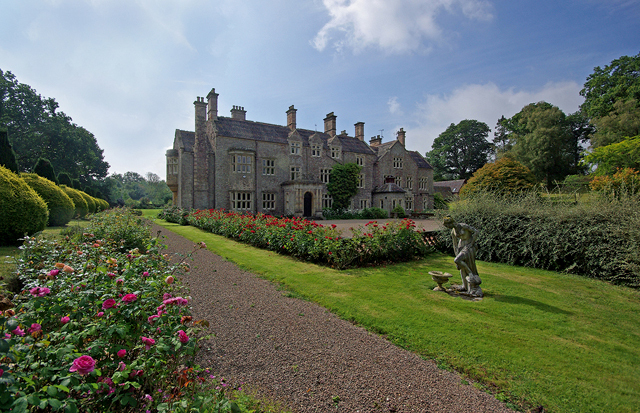 A substantial investment of money and time could return romantic Cefntilla in Monmouthshire to its former glory. £1.65m. The house was substantially enlarged in its original Tudor style by Richard Somerset, 2nd Lord Raglan, under the direction of Sir Mathew Digby Wyatt and his brother, T. H. Wyatt. Further additions, including the coach house, were made later in the 19th century. The house, which boasts 14,800sq ft of accommodation—including the impressive Great Hall, five further reception rooms, six first- floor bedrooms and nine second-floor bedrooms—stands in 621⁄2 acres of formal gardens, woodland, parkland and paddocks overlooking the rolling Monmouthshire countryside. The splendid formal gardens, pleasure grounds and park were all part of Lord Raglan’s grand vision for Cefntilla, but it will take a fresh vision, a feeling for the mansion’s remarkable history and a substantial investment to translate that vision into a viable, 21st-century country house, making it perhaps the perfect project for a returning expatriate to get his teeth into, suggests selling agent Anthony Clay.